Older homes often come with plenty of potential, and if you’re willing to put in the work, that potential can turn into a home with tons of charm! That was the case with this historic coastal home. After designing the master bedroom and family room (which you can see HERE), the living and dining space was up next. 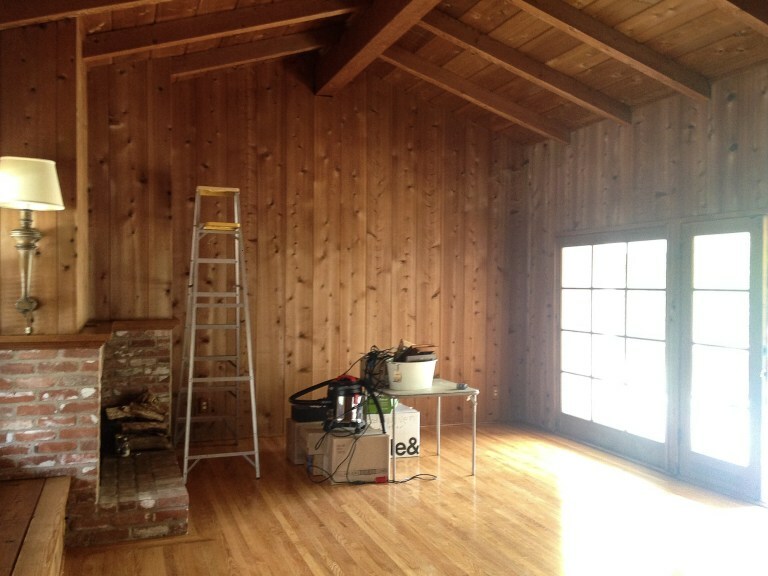 Beginning as a fully wood paneled room, it felt outdated and dark. We believe preserving history in an older home is important, but we find that it has to suit a client’s lifestyle in order to be enjoyed. This room had great features like the wood beams, fireplace, and french doors, but with so much orange-stained wood, the space wasn’t inviting and all of those special features just blended in. We decided that instead of preserving the entire room, it would suit the clients and the space better to highlight the best features and bring the rest up to date. 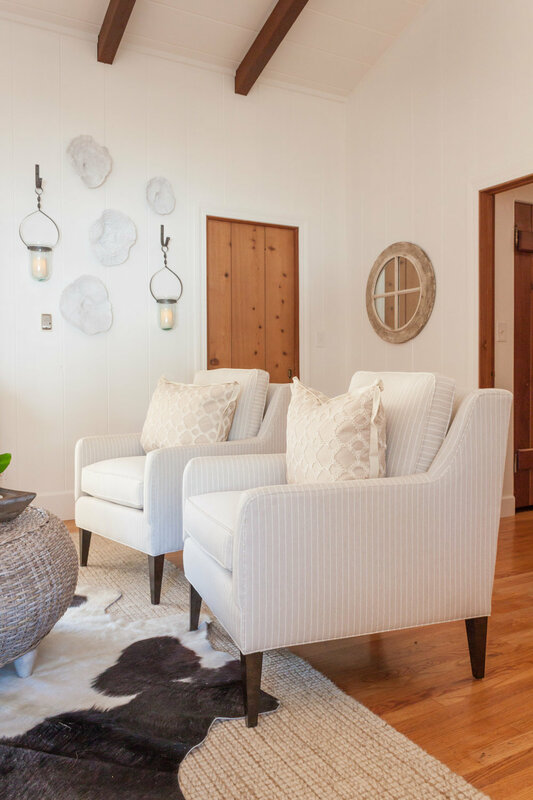 So, with lots of creamy white paint, natural colors and textures, along with fresh greenery, we brightened it up and created a space with timeless coastal charm. Check out the before and after photos below! While we designed the rest of their house to be kid-friendly, our clients requested a more formal room where they could entertain. 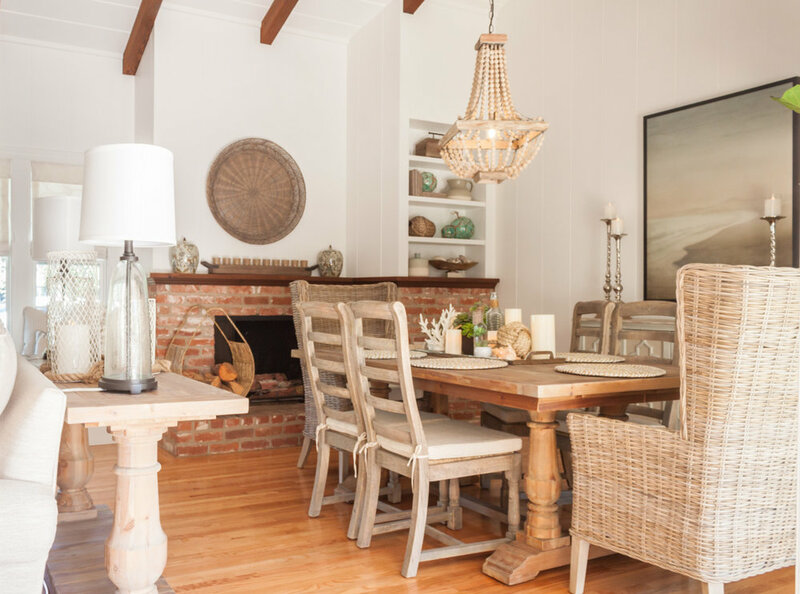 Of course, the layout of the space meant it was too big to be just another family room, and we really wanted it to be functional as a more formal space. So, we had the idea to make two rooms in one. 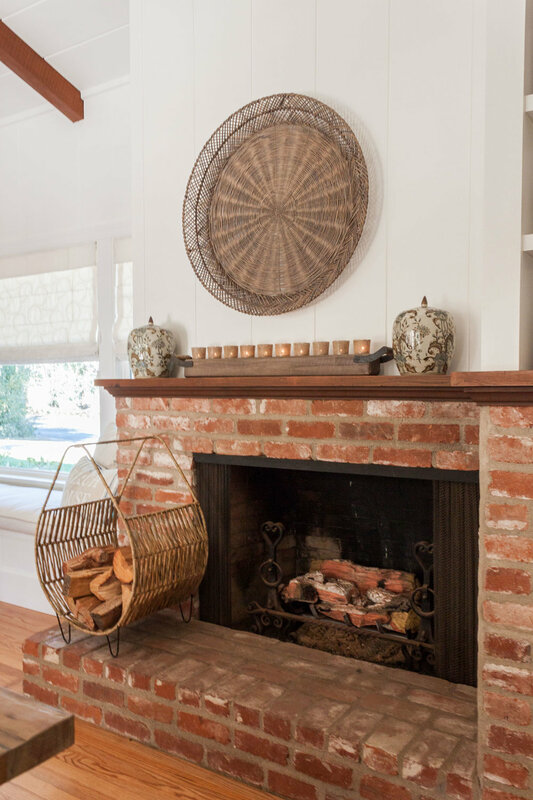 On one side is a comfortable tone-on-tone sitting area, and by the fireplace is the formal dining space. To finish it off, the lighting fixture acts as a defining detail making the two spaces feel separate while remaining complimentary. Now bright and airy, the best features of this room have come out of the woodwork (so to speak) and are now showcased in this timeless space. It’s now ready for good conversations, scrumptious meals, and new memories to be made! Thanks for reading! Welcome to part two of Not your Mama’s Southwest Style! (You can check out part one HERE). As I mentioned in part one, Southwest style can get a bad rap, so if it makes you think of the 80’s—erase that idea. No peach, no turquoise, and no white wicker here. When it comes to today’s Southwest style, we want to create a natural look with pops of color and character. Here are a few tips if you’re looking to integrate this fun style into your own home. First, mind your color palette. Choose a variety of warm and cool earth tones. The desert has tans and terra-cotta, but it also has cool navy blues too, which we used in this particular design to balance out our colors. Second, find a few statement pieces and have fun with them! We used antique wooden shutters, the clients favorite artwork, and other wooden tidbits with character to really add in that southwest flare. As with any style, always think scale, proportion, and balance. Make sure your furniture and accessories are all big enough to fill your space. Every detail should compliment the scale of your home. Texture can also be brought in through patterns. 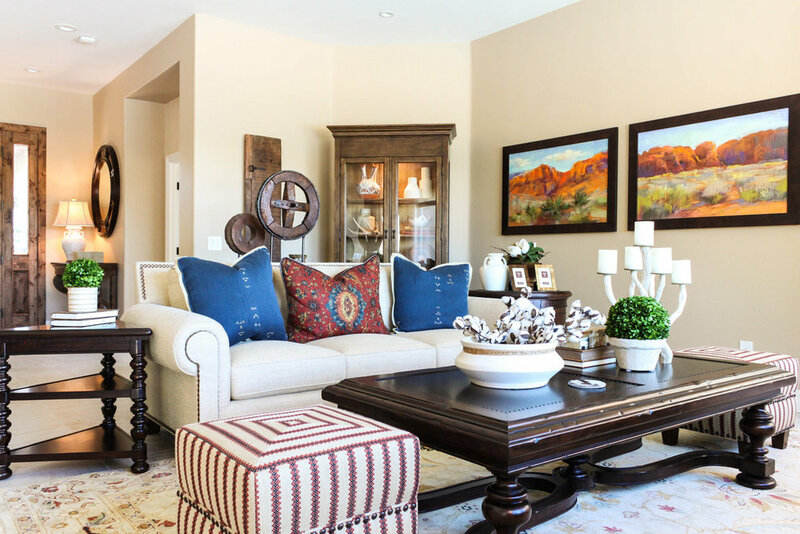 With lots of natural fiber and neutral hues, adding in pops of colorful, patterned fabric ties in the art and creates that modernized southwest style. 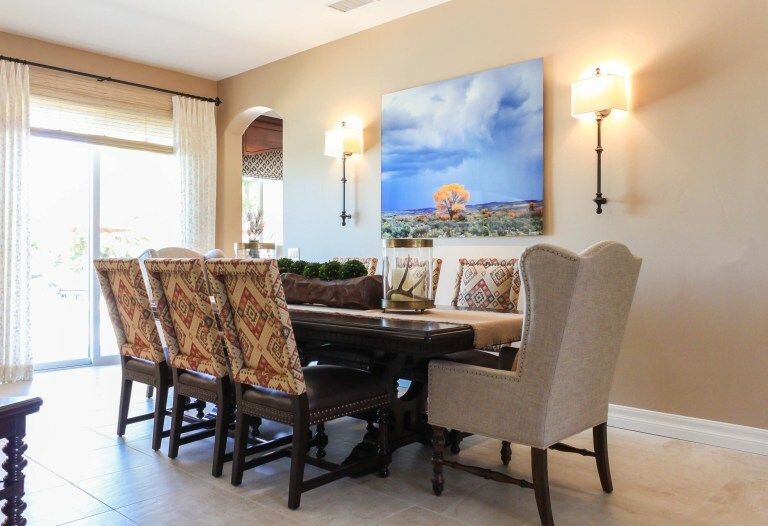 We loved bringing together this southwest home and creating a fresh style for this family to enjoy. We also hope you’ll never think of southwest the same! Thanks for reading! 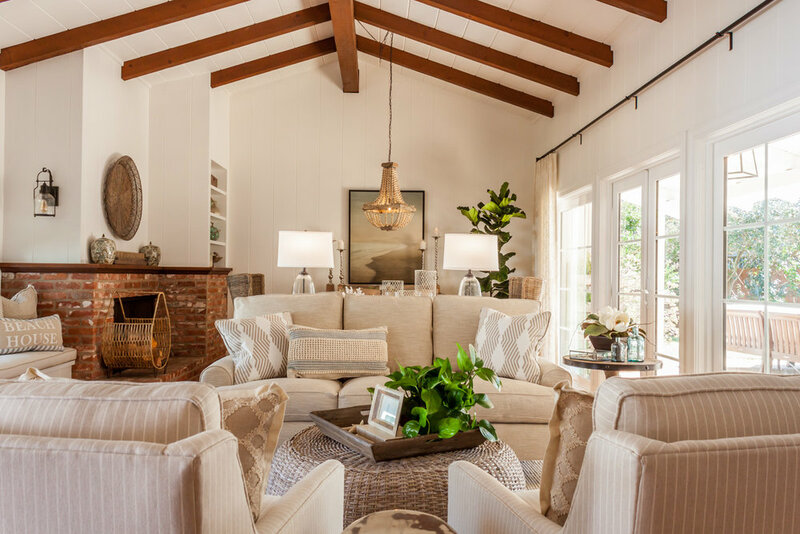 After a full remodel of their home, these clients wanted fresh decor to compliment their new space. But after trying to design it themselves, they found the look was never quite what they hoped. Color, scale, and proportion are the design ingredients that make or break a space. They can either act as culprits for a design that doesn’t fit or create a well-balanced, curated home. Once we got the call to step into this project, that’s where we began. 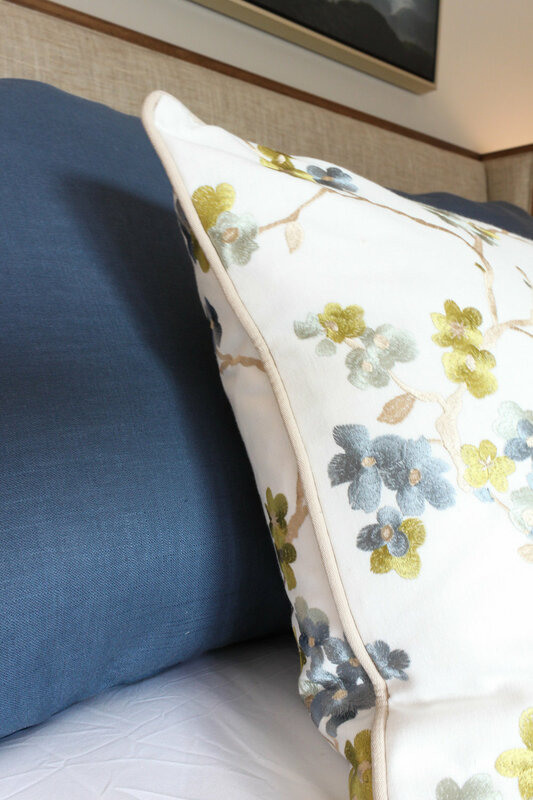 We pulled current fabrics that would compliment the tones found in their living room rug, the only piece of decor they wanted to keep. Drawn to a more traditional style, rich woods, and neutral hues were the key to the surrounding furniture, while pops of blue tie the rug, art, and accessories together. These details combined with a balanced proportion and scale finally gave these clients a home that truly fit their vision. 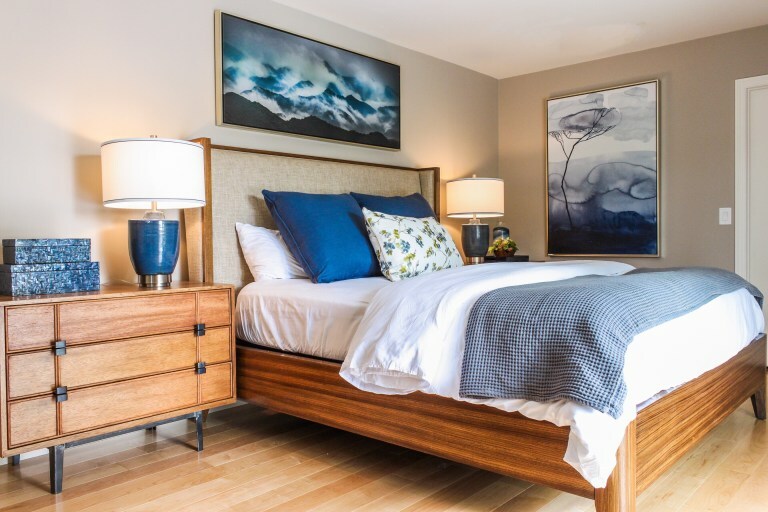 While the rest of the house needed to be durable and fit for the whole family, their master bedroom needed to be a place of relaxation and rest—a getaway with something special. Keeping the colors light and the decor bright and airy, we gave them a room that acts as a retreat for just the two of them. We love that we got to bring these clients vision to life and made their house into a true home. Thanks for reading! Sometimes the houses that have something unique to offer are the ones with a bit of history behind them. So, when our client had the opportunity to restore his childhood home he took it, ready to create new memories within an updated design. While some houses allow you to fill them with the style of your choice, others dictate the feel that fits best. When it came to this mid-century home, Lead Designer, Julie Benitez, found that the architecture led the way for a contemporary design that features a touch of history. We love an open concept, but it’s important to keep it balanced and functional. In this expansive room, we were able to create a dining, sitting, and living room in one open space that all flow seamlessly together. Plus, we love that each section encourages comfortable conversation. We loved giving this space new life, making it possible for our clients to create memories for years to come. It’s truly special when an old house becomes a forever home. Thanks for reading!